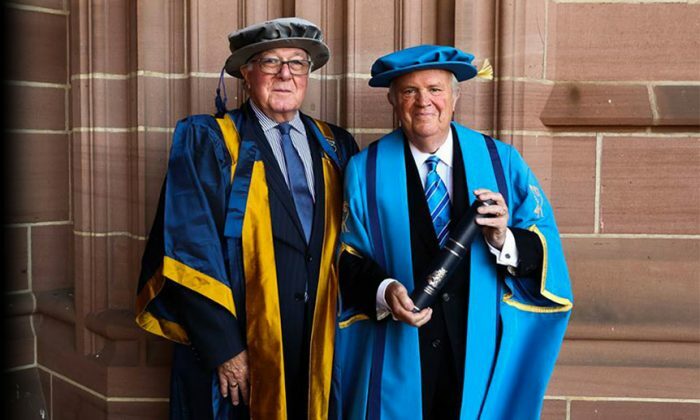 Lawrence DeNardis, a member of the Connecticut State Board of Regents for Higher Education (BOR), recently received the award of an Honorary Fellowship of Liverpool John Moores University (LJMU). One of 12 Fellows chosen for 2017, DeNardis was honored for his outstanding achievement in creating transatlantic academic opportunities. He was instrumental in helping to establish the pioneering transatlantic partnership between Southern and LJMU, which provides a unique student exchange program, including opportunities for joint degrees. DeNardis received the award during LJMU’s graduation ceremony, held at Liverpool Cathedral before an audience of over 3000 graduates and guests. The Trans-Atlantic Alliance between SCSU and LJMU, now in its third year, has included research internships, study abroad for students from both institutions, faculty exchanges, and the approval of the first programs in a portfolio of joint master’s degrees. SCSU President Joe Bertolino and former Provost Ellen Durnin were part of a small delegation that visited Liverpool in May to meet with LJMU leadership and advance the university’s first major international partnership. The Fellowship was presented to DeNardis by Sir Malcolm Thornton, who joined LJMU’s Board of Governors in 2001 and became chairman and pro-chancellor in 2007, a position he held until 2013. Thornton and DeNardis have known each other for 35 years and share a “passion for education as an engine of change,” said Thornton in his remarks during the presentation. A few years ago, together they began to plant the seeds for the transatlantic partnership between LJMU and SCSU. LJMU’s highest honor, the Honorary Fellowship is bestowed each July during Graduation Week upon a select group of individuals from outside the university, in recognition of their outstanding achievement in a given field or profession, and who personify the university’s ethos and go on to inspire others. The Fellowship of the university is an association of individuals who are closely connected with the work of LJMU, and Fellows play an active role in the life of the university by delivering guest lectures, hosting events, helping with projects and in some cases mentoring and supporting individual or groups of students. DeNardis’ own academic career includes 16 years as an associate professor and chairman of the Department of Political Science at Albertus Magnus College, visiting professor of government at Connecticut College, guest scholar at the Woodrow Wilson International Centre for Scholars of the Smithsonian Institution, and seminar instructor at Yale University. He earned his bachelor’s degree in economics from the College of the Holy Cross and a master’s and a Ph.D. in government from New York University. He has pursued a combined political and educational career and as a public servant has worked to create opportunities to raise the aspirations of the communities he has served, Thornton said. President Emeritus of the University of New Haven and a former United States Congressman from Connecticut, DeNardis has been a federal and state legislator and chief executive officer, in addition to his work as a political science professor. He represented Connecticut’s Third District in the U.S. House of Representatives from 1981 after serving five terms in the Connecticut State Senate from 1971. He was the Acting Assistant Secretary for Legislation at the U.S. Department of Health and Human Services in 1985-86 and was appointed by President George Bush to serve as a member of the Board of Regents of the National Library of Medicine. In 2005 and 2006, DeNardis was an official election observer for national parliamentary and presidential elections in Ukraine and Tanzania and co-chaired delegations from both the Association of former members of Congress and the National Democratic Institute for International Affairs. He also led a delegation of former members of Congress to meet with the new president of Chile in February 2006. DeNardis was appointed in 2012 to the BOR, which governs Connecticut’s four state universities; 12 community colleges; and Charter Oak State College.